For about a month, it seemed as if Matt de Ferranti would be the only Democrat to throw his hat in the ring and run for County Board this fall. With the Board’s lone non-Democrat, independent John Vihstadt, up for re-election, local party activists have been eyeing 2018 for years now. Yet, when de Ferranti announced his bid in January, he didn’t have much in the way of competition from his fellow Democrats, a stark departure from the surge in Democratic candidates in other races across the state. De Ferranti, a lawyer and advocate for Native American education, has spent plenty of time in civic life since moving to the county five years ago — he’s sat on a variety of commissions and volunteered for local Democrats. But he’s also a first-time candidate and far from a sure bet to knock off Vihstadt. Nevertheless, for weeks, he remained the only Democrat in the race, even as Jill Caiazzo made a pledge to run an open primary for the nomination a key part of her successful run to become chair of the Arlington County Democratic Committee. 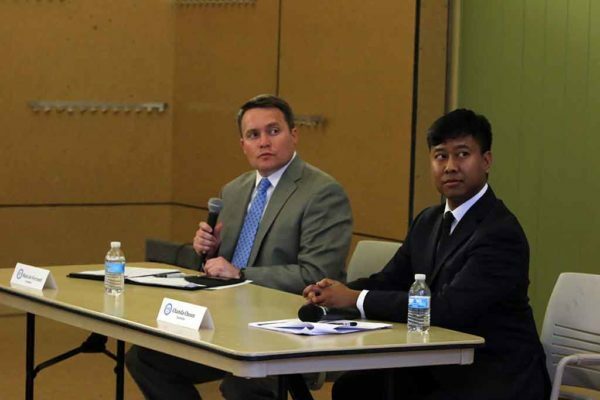 Chanda Choun, a cybersecurity staffer for software company Securonix, changed all that when he announced his own run in February, setting up Tuesday’s primary contest. Choun freely admits that his decision to enter the race caught some in the party by surprise, noting that he only moved to the county in 2015 and became active politically immediately following President Donald Trump’s election. But he also believes his background as a Cambodian immigrant and Army reservist will help him overcome his lack of experience, even though a cadre of Arlington officials and civic leaders have lent de Ferranti their support. De Ferranti, however, argues that his “relevant experience” working with elected leaders in county government shouldn’t be overlooked. He may not be quite as young as Choun — de Ferranti is 44, Choun is 30 — but he believes he’d also provide fresh perspective on the Board, informed by his years of experience. On policy matters, there isn’t much separation between the two. Both believe the Board needs to keep investing in county schools, transportation projects and affordable housing, even as financial pressures squeeze the county government — they’re also both willing to support a potential tax increase next year either, a distinct possibility as commercial tax revenues keep plummeting. Neither candidate is a big fan of Vihstadt either, though both do acknowledge that the independent hasn’t radically disrupted the Board’s dynamic. To that end, both Democrats want to see the county lure more businesses to Arlington and reverse the skyrocketing commercial vacancy rates in Rosslyn and Crystal City. The pair differs on how they’d approach that vexing question, however. De Ferranti prefers to “look toward the next economy” by marketing the county to “clean tech and green tech” companies — he’s also open to further exploring the possibility of using vacant space in Crystal City to house students, a proposal often bandied about as the school system runs out of available land. Choun wants to step up the county’s marketing efforts to lure in new businesses, but also lean on his experience in the military and in government contracting to bring federal government agencies back to Arlington, after many have fled. Another key separation: their feelings on the oft-discussed, but seemingly sidelined, Rosslyn-Georgetown gondola. Choun is open to studying the project in more detail, but de Ferranti is a bit more ready to write it off. But with relatively few policy disagreements separating the pair, Choun expects that his background, as both an immigrant and a tech-savvy millennial, will help separate him from de Ferranti. De Ferranti, meanwhile, is counting on his more traditional approach of winning local office to carry the day. Beyond just the endorsements of the county’s Democratic establishment, he’s also pulled in plenty of cash from its traditional donors — he’s raised more than $54,000 over the course of the campaign from more than 175 different people, according to state records. By comparison, Choun has managed to pull in nearly $30,000, with $25,000 coming in the form of a loan from Choun himself.